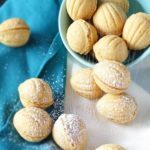 These beautiful Walnut Shaped Cookies with Dulce de Leche filling (oreshki) are golden, melt-in-your mouth, crispy on the outside and creamy on the inside little pastries. These are like a symbol for Ukrainian families. Every major holiday, weddings and special events have these on the menu. These are one of the favorites and have similar meaning and taste as the Peach Pastries dessert. This oreshki version requires a special mold to be used in an oven. I bought 2 of mine on Ebay in past. A lot of you already told me you have the exact same mold as mine, but just waiting for the recipe, which is perfect! When you google “oreshnitsa” you’ll see options popping up. I could not find the exact one I have but if you already have some kind of oreshnitsa, I’m sure it’ll work too. I have never worked with gas version so please don’t ask me questions about it because I will not know the answer lol 🙂 . I would assume this recipe would also work for the gas version, but bake them for whatever time you would usually do. From several recipes, this recipe is a favorite around my family and friends. 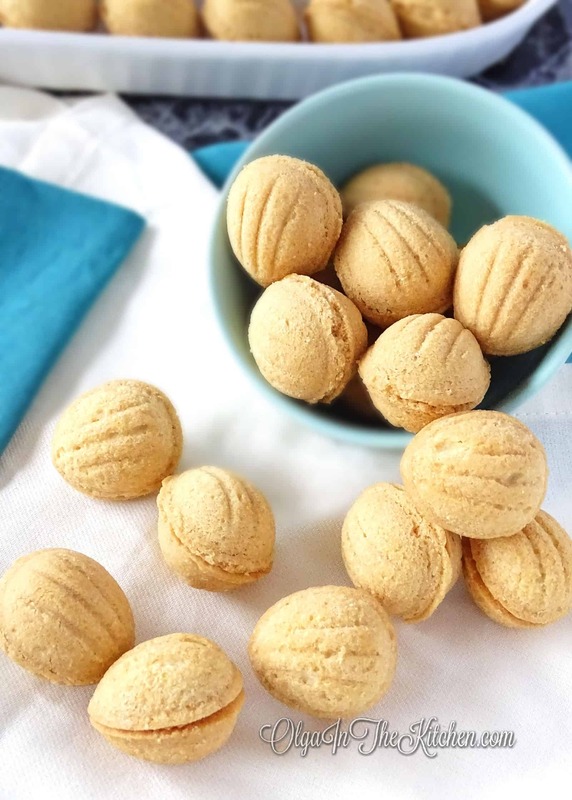 No one likes a hard-shelled cookie, everyone wants very crumbly and fall-apart once you put into your mouth 🙂 This recipe was a winner, therefore I keep making this one and only this one for past years. 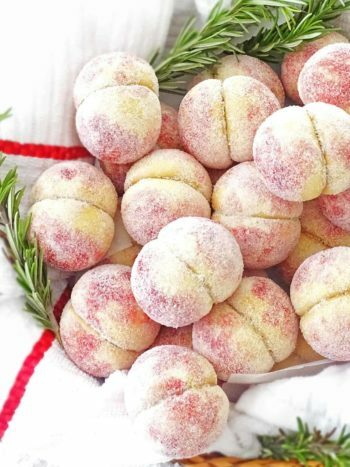 Fill them, give them time to set and cool in refrigerator. These taste better cold than room temp. Well, mostly all pastries like these taste better cold. You can bake them ahead of time and store in plastic containers for couple weeks. The brand of flour your use plays a huge roll in here. Different brands and different expiration dates have different moisture. Few years ago when I ran out of my usual flour, I used Costco one and had to add half a cup more than the recipe called for to reach that consistency. 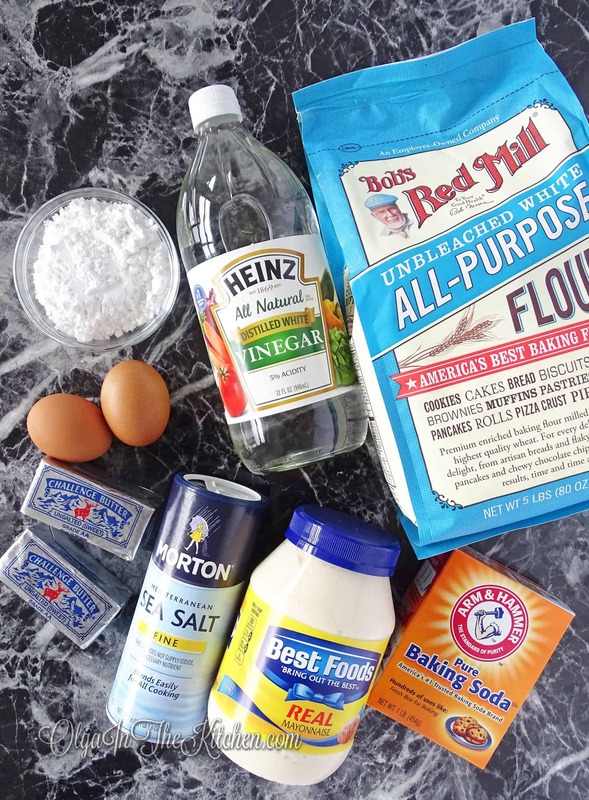 If you’re working on the dough, and you feel the dough is a bit too soft, add more flour – by tablespoons. Refrigerating the dough for at least an hour is a requirement in order for the oreshki to hold the design that’s on the mold once baked. 1. In a medium bowl, combine and beat together 1/2 cup powdered sugar, 2 egg yolks and 1/8 tsp salt on low for about 1 minute. In a small bowl stir together 1/2 tsp baking soda and 1 tsp distilled white vinegar – it will fizz. Then add the baking soda mixture, 2 sticks unsalted butter and 1 tbsp mayo to the egg yolk mixture and beat on low for about 1 minute. 2. Sift and stir in 2 1/2 cups all-purpose flour just until mixed in. (I beat on low 1 cup and then stir 2nd with spatula and remaining ½ cup). Dough will be sticky and you might think it needs more flour, but adding more flour will make the cookies really hard. 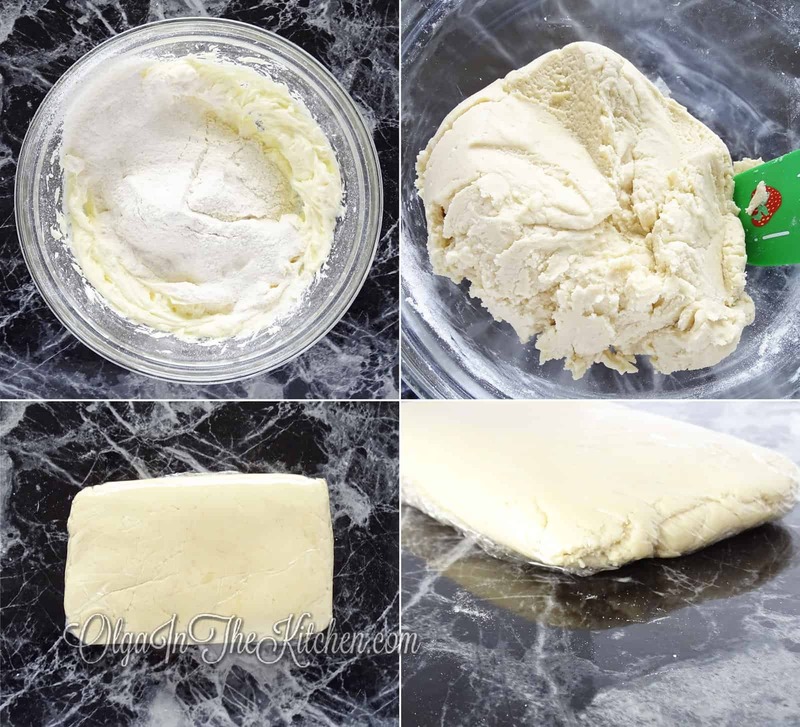 Wrap dough with food wrap and make it flat to about 1-1 1/2″ thickness. Refrigerate up to 2 hours until dough is hard. (Sometimes I do overnight). 3. 2 HOURS LATER: Preheat oven to 375°F. Shape little balls (about 1/2”-3/4”) from the cookie dough and place into each walnut shape. First press each ball in the middle with a thumb and then using your index finger keep going around the mold pressing the dough until the mold is lined with a very thin layer about 2mm thickness, without any part of mold showing through. Shave off excess with help of a knife. Gently put the cover of the walnut shaped mold over the filled molds, BUT don’t press. Bake for 27-30 minutes. (NOTE: You want them nice and round inside, but without too much extra cookie around the edges once baked. You might need to slightly shave off edges in some cookies once baked to make them perfect or you can leave the way it is. With this crispy dough, it’s very easy to crash sides when shaving off. You can also bake without the walnut mold cover and not worry about shaving sides off. Refer to step 5 if you want to go with this other method). Refrigerate remaining dough while first set is baking. Once baked, remove from the oven, remove the mold cover and remove cookies right away. Usually my walnut shaped cookies are stuck to the cover. 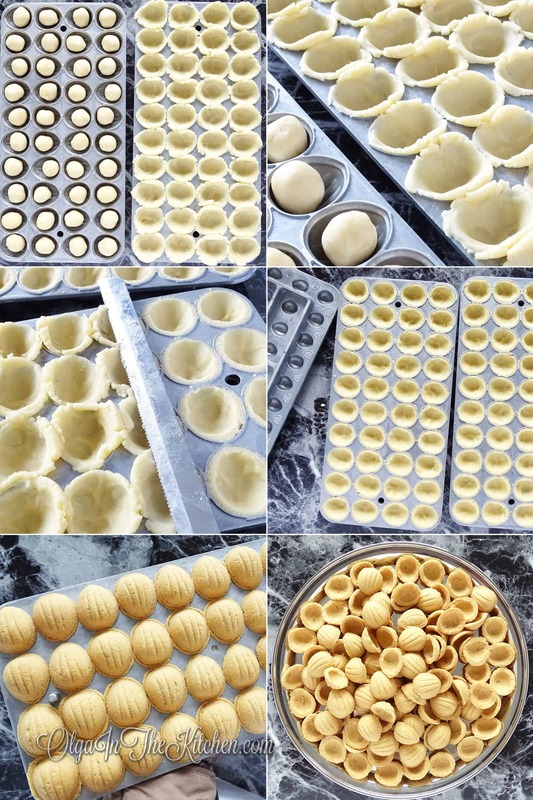 You can use a sharp knife to take them off, but don’t poke the sides to prevent from crashing OR like me, I use my hands and gently take them off – they come off very easy because of the butter dough; you’ll even see a bit melted butter right away when you remove each cookie. (Avoid from throwing the baked cookies onto a tray or dish to prevent from crashing – think gentle 🙂 and place them instead of throwing). Let the mold cool or take it outside to completely cool to bake the remaining dough, otherwise the dough will melt fast and it will be hard to work with; cookies will also bake faster by about 10 minutes if the mold isn’t completely cooled. Let the cookies cool while you make the filling. 4. 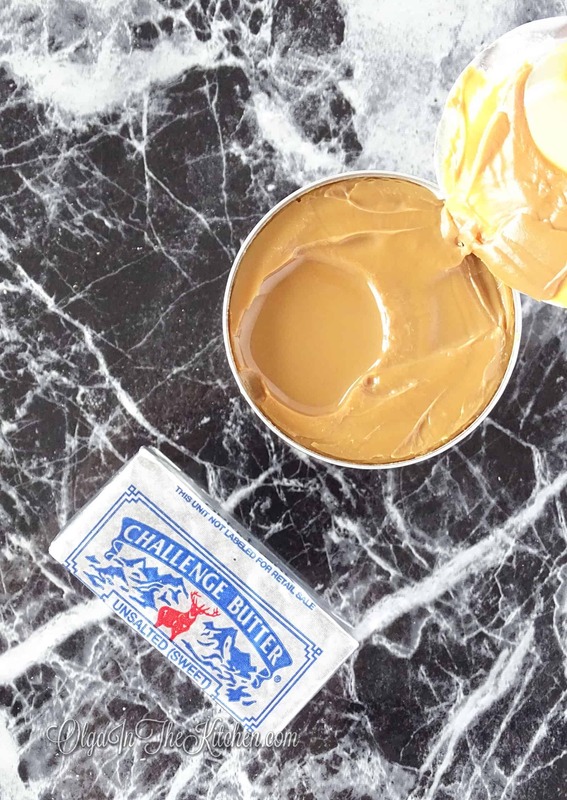 In a medium bowl, combine 1 can dulce de leche and 1/2 stick unsalted room temp butter. Beat on high for about 2 mins until no more butter pieces can be seen. Refrigerate the filling for about an hour. (NOTE: I usually make the filling before I bake the cookies, and let it refrigerate so that it gets thick. It’s much easier to work with thicker dulce de leche than have it leak out of cookies when you’re trying to fill and place together). With help of dull knife, feel each walnut shaped cookie completely without going over the sides. Gently, without pressing, put 2 pieces together, and place onto a serving dish with the part where the cookies are pressed being around on sides instead of touching bottom of tray to prevent from filling leaking out while these firm up in refrigerator. Enjoy the next day or throughout the week – just keep them refrigerated if these are not being eaten! 5. BAKE WITHOUT MOLD COVER: Shape and shave off excess cookie dough as you would in step 3, but without covering them with mold cover. Bake at 375°F for approximately 20 minutes. This method bakes with perfect edges, but the only thing I don’t like is that the middles are not as perfect as pressed and when you actually close the cookie, it might have a slightly bigger gap due to the cookie edge top being little bumpy. And to be honest, I go by this method anyway because it’s slightly easier: D ). 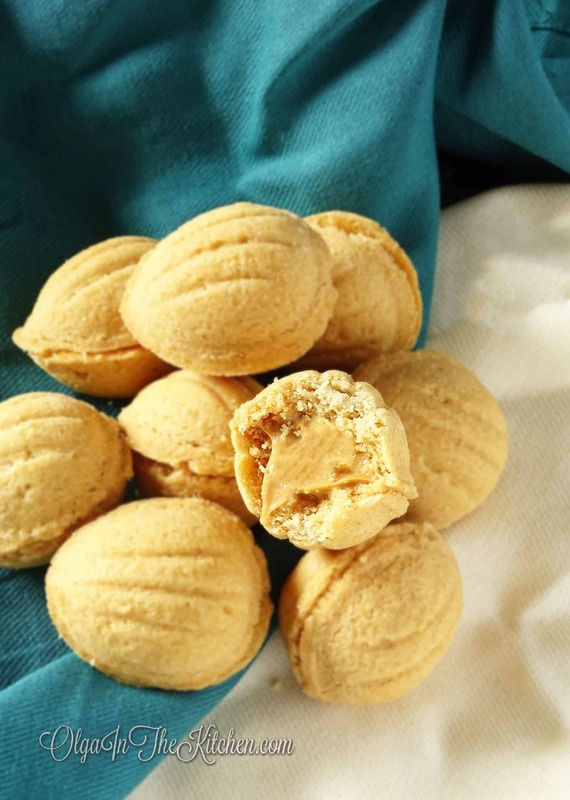 Walnut Shaped Cookies with Dulce de Leche filling (oreshki): golden, crispy on the outside and creamy on the inside. A holiday favorite! In a medium bowl, combine and beat together 1/2 cup powdered sugar, 2 egg yolks and 1/8 tsp salt on low for about 1 minute. In a small bowl stir together 1/2 tsp baking soda and 1 tsp distilled white vinegar – it will fizz. Then add the baking soda mixture, 2 sticks unsalted butter and 1 tbsp mayo to the egg yolk mixture and beat on low for about 1 minute. Sift and stir in 2 1/2 cups all-purpose flour just until mixed in. (I beat on low 1 cup and then stir 2nd with spatula and remaining ½ cup). Dough will be sticky and you might think it needs more flour, but adding more flour will make the cookies really hard. Wrap dough with food wrap and make it flat to about 1-1 1/2″ thickness. Refrigerate up to 2 hours until dough is hard. (Sometimes I do overnight). 2 HOURS LATER: Preheat oven to 375°F. Shape little balls (about 1/2”-3/4”) from the cookie dough and place into each walnut shape. First press each ball in the middle with a thumb and then using your index finger keep going around the mold pressing the dough until the mold is lined with a very thin layer about 2mm thickness, without any part of mold showing through. Shave off excess with help of a knife. Gently put the cover of the walnut shaped mold over the filled molds, BUT don’t press. Bake for 27-30 minutes. (NOTE: You want them nice and round inside, but without too much extra cookie around the edges once baked. You might need to slightly shave off edges in some cookies once baked to make them perfect or you can leave the way it is. With this crispy dough, it’s very easy to crash sides when shaving off. You can also bake without the walnut mold cover and not worry about shaving sides off. Refer to step 5 if you want to go with this other method). Refrigerate remaining dough while first set is baking. Once baked, remove from the oven, remove the mold cover and remove cookies right away. Usually my walnut shaped cookies are stuck to the cover. 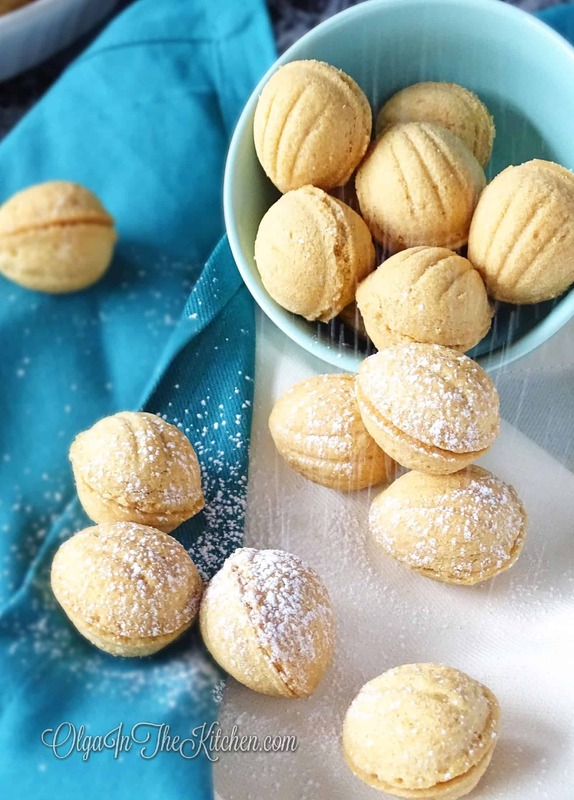 You can use a sharp knife to take them off, but don’t poke the sides to prevent from crashing OR like me, I use my hands and gently take them off – they come off very easy because of the butter dough; you’ll even see a bit melted butter right away when you remove each cookie. (Avoid from throwing the baked cookies onto a tray or dish to prevent from crashing – think gentle and place them instead of throwing). 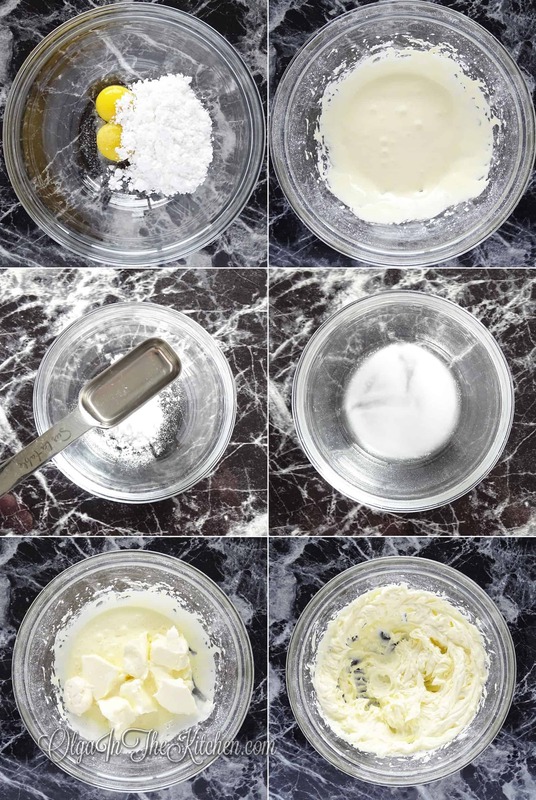 Let the mold cool or take it outside to completely cool to bake the remaining dough, otherwise the dough will melt fast and it will be hard to work with; cookies will also bake faster by about 10 minutes if the mold isn’t completely cooled. Let the cookies cool while you make the filling. 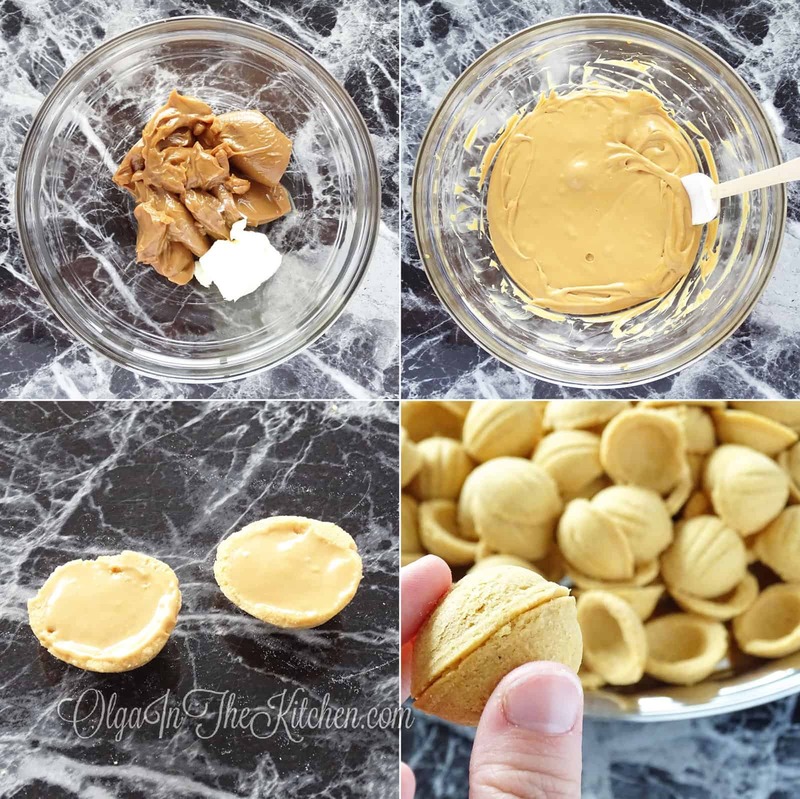 TO MAKE THE FILLING: In a medium bowl, combine 1 can dulce de leche and 1/2 stick unsalted room temp butter. Beat on high for about 2 mins until no more butter pieces can be seen. Refrigerate the filling for about an hour. (NOTE: I usually make the filling before I bake the cookies, and let it refrigerate so that it gets thick. 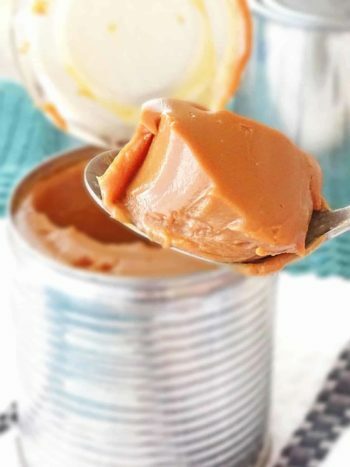 It’s much easier to work with thicker dulce de leche than have it leak out of cookies when you’re trying to fill and place together). 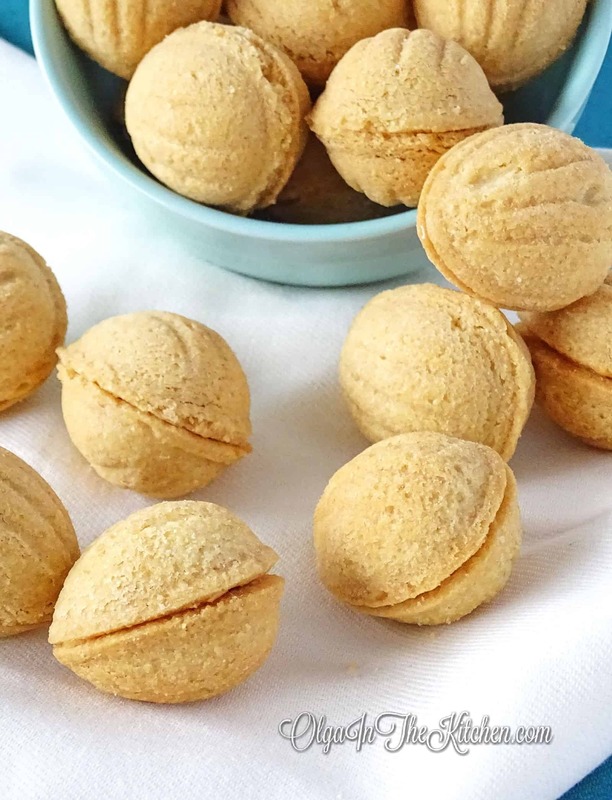 With help of dull knife, feel each walnut shaped cookie completely without going over the sides. Gently, without pressing, put 2 pieces together, and place onto a serving dish with the part where the cookies are pressed being around on sides instead of touching bottom of tray to prevent from filling leaking out while these firm up in refrigerator. Enjoy the next day or throughout the week – just keep them refrigerated if these are not being eaten! BAKE WITHOUT MOLD COVER: Shape and shave off excess cookie dough as you would in step 3, but without covering them with mold cover. Bake at 375°F for approximately 20 minutes. This method bakes with perfect edges, but the only thing I don’t like is that the middles are not as perfect as pressed and when you actually close the cookie, it might have a slightly bigger gap due to the cookie edge top being little bumpy. And to be honest, I go by this method anyway because it’s slightly easier: D ). I made your recipe on the electric version of oreshnitsa. Worked out great. Like you mentioned, these have to be handled gently because they are easy to break. They taste much better cold straight from refrigerator rather than room temp. I loved how easily they melt in your mouth and how crispy they are. Everyone loves that fact about them. In the past, I used to make a hard shelled version and I kept looking for something mouth-watering until I came across your recipe. It seems like everyone around me likes oreshki crispy. No one complained about the hard-shelled before because they never tasted a better version like yours. Few ladies even asked for the recipe ; I just had to share. These were just so good! Thank you again! Thanks Olena for spreading the word 🙂 I’d glad you liked these so much. We also like them so much because how gentle these are! These are a hit in my house! My whole family just loved them. With Thanksgiving and Christmas coming up, I’m planning to double the portion and make more of them. 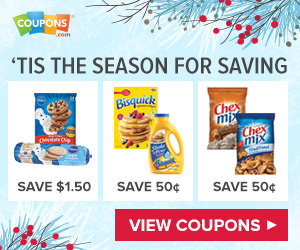 They save really nice in fridge, something that can be prepared almost a week in advance. 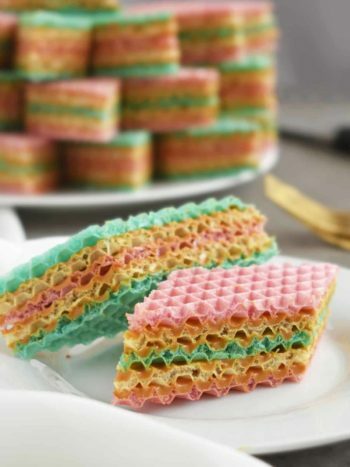 With the coming parties, these is a great dessert. Thank you for sharing such incredible recipes! You’re welcome Nina! Make sure to do each batch separately to avoid any disappointments. From experience, when you double a portion into a same bowl, you tend to end up with quiet different results. Hi Olga, I made these oreshki and both, my husband and I loved them. The texture of these literally melt in mouth. I have never tasted better oreshki. Thank you for another amazing recipe! Aww thanks Diana for such a great review!